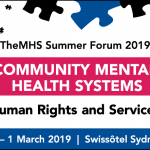 Over the last 28 years of TheMHS Conferences, Summer Forums and Award programs, we’ve accumulated one of the most comprehensive records of mental health services, programs and research in Australia and New Zealand, and we think it’s worth sharing! In this Resource Library, you will find proceedings from 28 years of TheMHS Conferences, Award winning programs and services dating back to 1994, video and audio recordings of some of our keynote presentations over the years, as well as supplementary material (including PowerPoint files) from these presentations. The contents of the Resource Library will be regularly updated, so be sure to check back to see what’s new. Please note that the Resource Library is a collection of presentations and other materials from TheMHS Learning Network events over the past 28 years. TheMHS Learning Network does not endorse the views of all authors or the content of all presentations and other materials. It’s simple! You may search by event (e.g. 2015 TheMHS Conference), by type (e.g. Awards Application), or by Keyword. Searching multiple fields at the same time will NARROW your results. E.g. Searching for the word “keynote” and the event “2003 TheMHS Conference” at the same time will deliver keynote papers and audio recordings only from 2003. With so many resources to choose from, we’ve put together a handy list of quick searches to get you started. What do young people need at a time in their lives when they are developing life skills? What are the key building blocks or Essential Components of Care [ECC] for contemporary mhs? Re-aligning services: How do we get the right services in the right places?